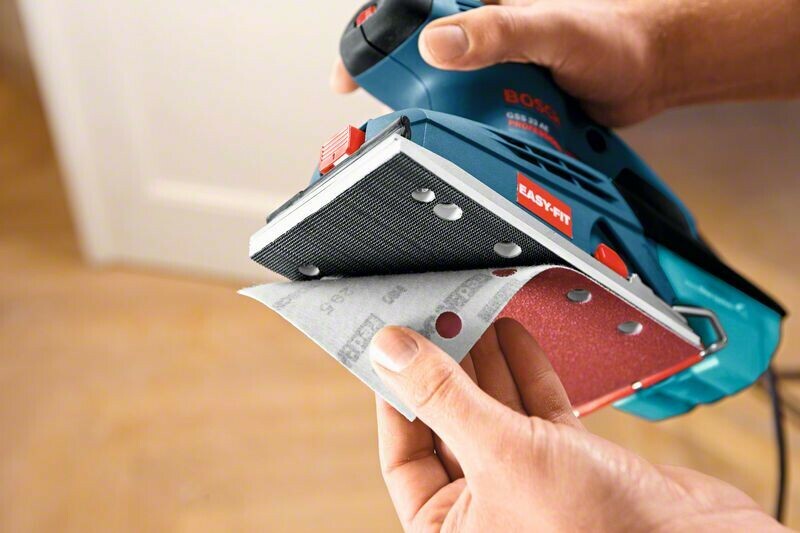 Every type of sanding sheet sits perfectly with Easy-Fit. 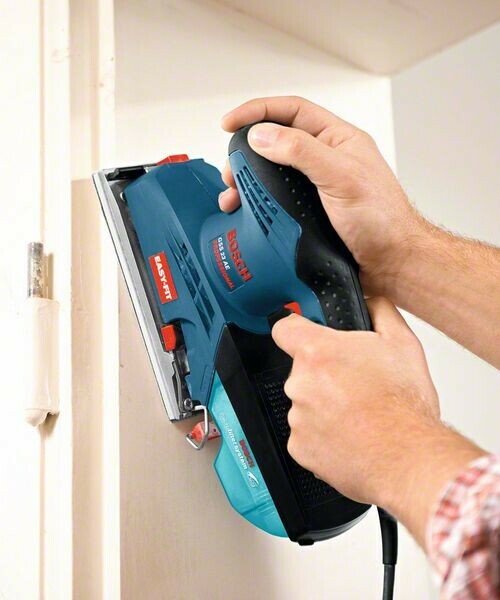 Thanks to the automatic paper tensioning, the revolutionary Bosch Easy-Fit System guarantees a perfect hold of the paper without creasing and tearing - for Velcro-type and roll paper. A perfect paper fit ensures maximum surface quality and optimum interaction with micro-filter for dust-free working. Control electronics for material-oriented working (the only one in this price class). Long lifetime thanks to sealed ball bearing and the high-quality white sanding plate. 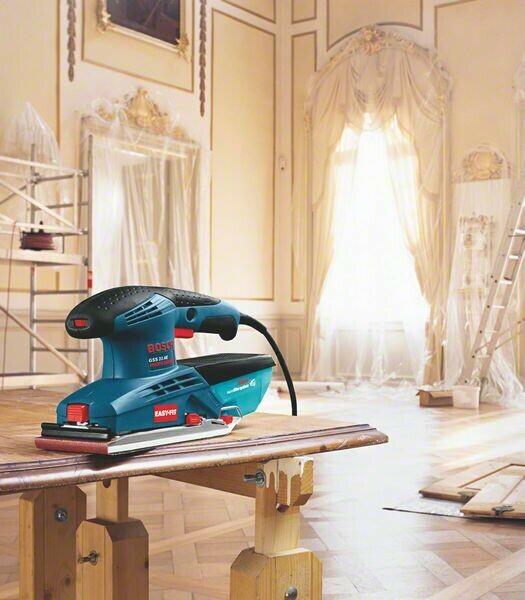 190 watts for high material removal rate. No-load speed: 7,000 – 12,000 rpm. No-load orbital stroke rate: 14,000 – 24,000 rpm. Sanding plate, width: 92 mm. Sanding plate, length: 182 mm. Sanding sheet for clamping, width: 93 mm. Sanding sheet for clamping, length: 230 mm. Sanding sheet with Velcro-type fastening, width: 93 mm. Sanding sheet with Velcro-type fastening, length: 185 mm. 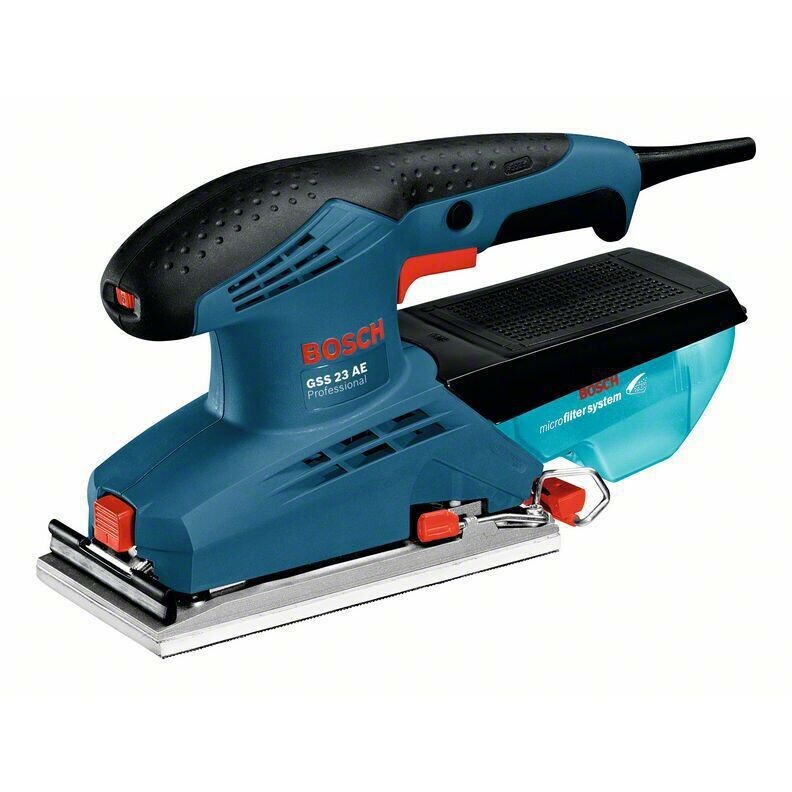 With this Bosch GSS 23AE we supply Hole punch, 2 sheets of sandpaper and Micro-filter box. Sorry, there is currently no video available for this product. 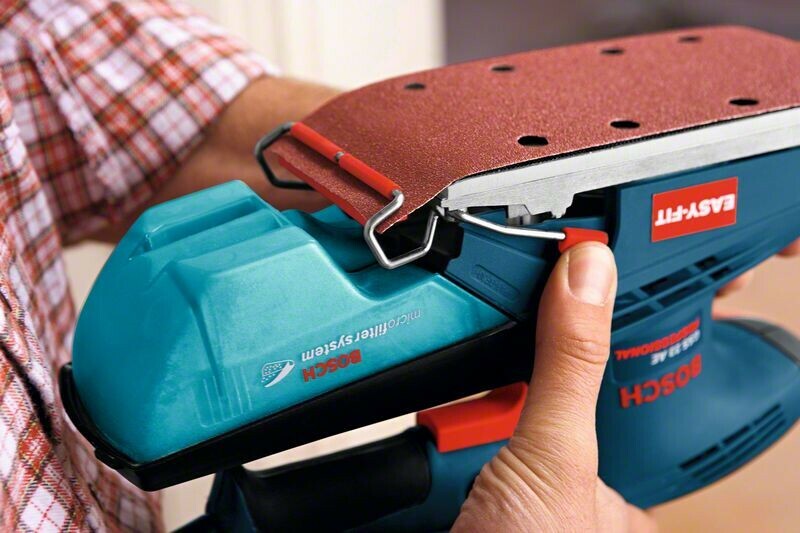 All warranty claims are dealt with by Bosch directly, who will arrange a collection, repair/replace the item, and return it to you. All orders over £100 Including VAT are delivered free within the UK, excluding Highlands & Islands and Northern Ireland. When you place an order with our website the cost of delivery will be automatically calculated in your shopping basket. UK Mainland orders below £100 Inc. VAT are £4.98 Inc. VAT. Some products which cost less than £100 Inc. VAT have free shipping, the same exclusions on destinations apply as above. If "with Free Shipping" products are in the same basket as products without Free Shipping, then the additional products do not receive Free Shipping, and the order is treated as above. All deliveries must be signed for, and will therefore not be left unattended. Deliveries are usually made during normal working hours. If you need to make any special arrangements with us for your delivery please contact us with your order number immediately after placing your order. Deliveries must be checked immediately upon receipt. If any damage is evident, please either sign for the delivery as 'damaged', marking the Carrier's receipt accordingly, or do not accept the delivery. Any damage or missing items must be reported within 24 hours of receipt to the returns department, including photos of the damaged goods where appropriate. Some heavier, bulkier, or hazardous items may also incur a shipping surcharge, we will inform you of the surcharge before we take payment for your order. In stock orders that are placed before 3:00pm Monday to Friday are despatched that day for the following working day. Requesting delivery to an address different to the billling address may delay your order from being despatched the same day. To calculate the cost of shipping an order to you, please put your items in the shopping basket, and then request a shipping quote. The price quoted will be for a single carton of up to 30Kg. If the weight/volume of your order exceeds this, we will contact you before shipping to confirm costs. If your country is within the EU and you are VAT registered, please enter your VAT number to get VAT removed. The number provided will be validated against VIES, if the number is invalid VAT will still be collected.